Are you looking for a Local TMJ Doctor near Rockville MD? We believe we’re well equipped to provide relief to those suffering with severe TMJ-TMD pain. Our TMJ clinic has a team of TMJ Dentists and Physical Therapists. Our Treatment protocols where dentists and physical therapists work side by side have been proven to be among the best way to treat TMJ. If you are experiencing the symptoms of TMJ and are looking for a TMJ dentist near Rockville call today. Airway Restrictions caused by a small mouth, small nasal passageways and crowded tongue and tonsil spaces. Stress and poor work conditions are major contributing or exacerbating factors, but they do not cause TMJ sypmtoms or pain alone. DNA Appliance is a unique appliance that Balances a Bad Bite and Opens the Airway. Sleep Apnea – The appliance helps the jaws grow larger, creating room for proper breathing and tongue position. The temporomandibular joint is the joint that literally connects the jawbone to the head. The Jaw bone is the Mandible and the head consists of several bones including the temporal bone. TMJ is an acronym for temporomandibular joint. The TMJ joint rotates and slided down and forward in its open position. It is the only joint in the body capable of 3D movement. TMJ disorders, technically called temporomandibular joint dysfunction or the acronym, TMD. TMD can be caused by trauma, but more often is caused by bruxism which is a condition where there is clenching and grinding of the teeth. The cause for clenching and grinding is 1) Bad Bite 2) an upper airway restriction or apnea that stimulates the clenching reflex at night time. Most TMD people will have some postural changes often complaining of neck and upper back tension and pain. Jaw pain, popping of the jaw joints, head ache, sore and sensitive teeth, sinus pressure, loss of hearing, vertigo, neck and upper back pain. The condition can often be self diagnosed. The symptoms will wax and wane with stress, seasonal allergies, barometric pressure changes and changes in habits and schedules or a triggering event such as a dental appointment or chewy meal. a complaint of pain in the jaw joint or jaw muscles accompanied with poor function of the jaw joint. Usually, the patient can diagnose themselves, but the condition is confirmed by a specially trained dentist. Treated with physical therapy, bite appliances, and airway opening appliances. What should you do if you think you have TMD? Is there a link between TMJ and Sleep Apnea? Yes. 70% of people who have Sleep Apnea have TMD and pain. The belief is the root cause of TMD symptoms is related to airway problems and improper breathing function. TMJ patients have often seen many professionals including Neurologists, Chiropractors, Physical Therapists and ENT doctors. Many times the diagnosis is missed or the patient receives migraine drugs for headaches from the Neurologist. TMJ symptoms can be treated and cured by a TMJ Dentist. At Natural Dentist Associates, we treat TMJ problems with a TMJ Dentist and Physical Therapist. The sources of TMJ Pain are facial muscles used for chewing, TMJ joint inflammation and teeth and gums getting too much pressure from Tooth Clenching. The cause of TMJ pain for many people is poor fitting teeth or what dentists call a Bad Bite. A Bad Bite can be caused by 1) Orthodontics, 2) Imbalanced Dental Crowns and Fillings, 3) Poor Pediatric Facial Development 4) Airway Issues or most often ALL THE ABOVE. People who have more complex TMJ Problems caused by Poor Facial Development, Airway Issues and Orthodontic Failures will need to be diagnosed and treated with DNA Appliance Therapy. The DNA appliance is ideal for treating individuals with TMJ Pain and combined Airway and Sleep problems. Research shows that most people who have TMJ pain also have some form of an Airway problem. Most patients are unaware they have Sleep and Airway problems. Severe TMJ Pain Treatment starts with diagnostic records, a full evaluation by the TMJ Dentist / Physical Therapist and Splint Therapy or DNA Appliance Therapy. 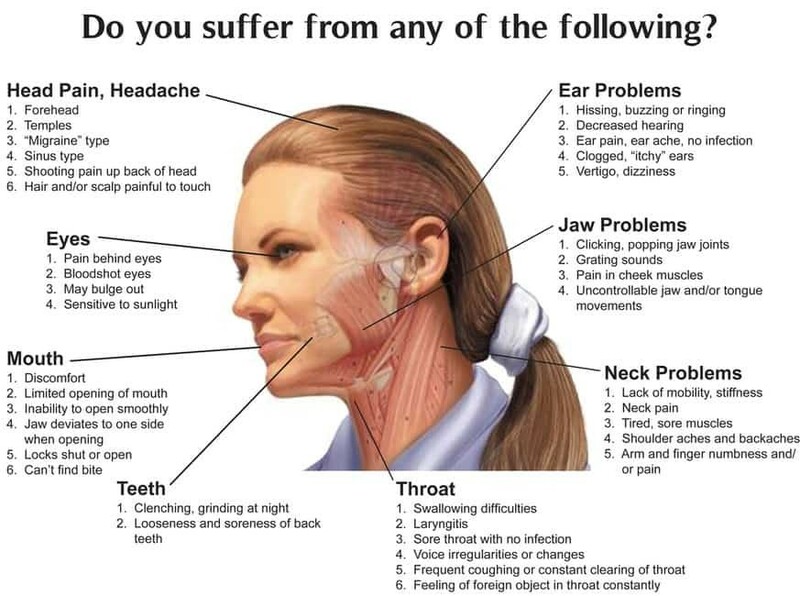 All TMJ Patients have a bad bite along with some neuromuscular and skeletal symptoms listed above and possibly Airway Issues. Therapies are done in our office by our TMJ Dentists and a skilled Physical Therapist who is certified in Postural Restoration. We work side by side, Dentist and Physical Therapist. At the end of Splint Therapy, the goal will be to recommend additional treatments that will correct the Bad Bite along with any associated Facial Development, Airway and or Orthodontic problems. Every Case is truly unique and there is no exact cookie-cutter treatment for TMJ since there are so many different causes and sources of pain. The key to successful treatment is proper diagnosis of the cause of the patients TMJ problem and a custom treatment plan that addresses the needs of the patients condition. The diagnosis of “TMJ” is an inadequate diagnosis and is not telling of the true problem. A qualified TMJ Dentist can identify the source of pain and develop a customized treatment. A night guard is a piece of plastic or acrylic that is made using the patients current bite path of closure. It is typically a little more balanced but does not involve a charge in the patients present bite path. A Splint is an appliance that makes a change to the path of closure and is corrective in nature. A splint is usually made after a detailed evaluation of the patients present bite, a diagnosis as to what is wrong and the appliance has a new bite path and position that should be a more restful place for TMJ Jaw joints and muscles. A splint is an orthotic and does not make any permanent changes to the patients mouth or teeth positions. The purpose of a splint is to establish a new more correct bite position and relieve the patients symptoms. Often more definitive treatment such a DNA appliance Therapy is performed after successful Splint Therapy. 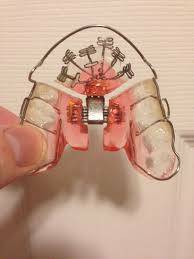 A night guard usually is of little to no value for TMJ therapy. A mouth guard is more appropriate for sports applications, etc. To solve or cure TMJ Pain related to a Bad Bite it is necessary to correct a patients poor bite, so the patient will stop Tooth Clenching and Tooth Grinding. Some patients are not aware that they clench. Most of the time the Tooth Clenching happens at night. The tooth clenching can often be a reflex stimulated by an Airway or Sleep Apnea problem. 1) Indirect treatment focusing mostly on reducing joint, muscle, gum and tooth inflammation. TMJ patients are treated by a TMJ Dentist and a Physical Therapist certified in Postural Restoration with corrective Bite Splint Therapy. Diagnostic records are taken to diagnose how the patients jaws and teeth are out of alignment and an assessment of the patients overall head, neck and body posture because they most certainly all relate. TMJ dental care is a specialty at our TMJ dental clinic and we believe the problem is a problem involving the entire vertebral system. Hence the need for a TMJ doctor and physical therapist who specialize in TMJ disfunction. Subsequently, a corrective bite splint or Occlusal Splint is made to correct the misalignment. A splint looks a lot like a hard plastic mouth guard, but an Occlusal Splint actually has a corrective bite and greatly reduces the patients clenching problem. In severe cases Botox can be used to medically calm down the muscles by injection of the drug into the tight chewing muscles. Botox will decrease the contraction of chewing muscles in spasm. The Botox is used as a last resort in severe cases of TMJ, muscle spasm and where there is limited mouth opening and range of motion. 2) once all the inflammation is better and the patient is less symptomatic, direct corrective treatment can be done to correct the patients bad bite. The correction depends on the patients problem. For example, a patients teeth may be in the wrong position and they may need to be orthodontically moved. The fit of the teeth may be poor and the patient may need bite adjustments and possibly some crowns and fillings redone. Occasionally, patients may have incompatible sized and shaped jaws top to bottom. There may be Airway issues related to the Tongue being tied or the lips being tied. Facial bone imbalances due to traumatic birth or poor development and genetics may be present. Many Facial bone imbalances can be corrected with ALF and DNA appliances. There most certainly is a link between TMJ problems and Sleep Apnea and often times Sleep Apnea can be cured or improved with our therapies. The Upper Teeth sit in the base of the human skull and directly in front of the entrance of the spinal cord into the brain cavity and directly underneath the Pituitary Gland. The longterm consequences of TMJ-Oral Facial Disease is Dental Breakdown, Airway Failure including Sleep Apnea and Full-body postural failure including muscular and skeletal dysfunction and breakdown especially in the head, neck shoulders, back and hips, increased stress, hormonal dysfunction and metabolic issues. Increasingly TMJ patients are found to be victims or poor pediatric facial development and or improper orthodontics involving tooth extractions, retraction and or aggressive Palatal Expansion. Many of these cases can be treated with Postural Integrative Bite Therapy and ALF Orthodontic and Orthognathic Therapy. These Therapies are done in our office by our Dentists and a skilled Physical Therapist Certified in Postural Restoration. We work side by side, Dentist and Physical Therapist. In some more sever cases of TMJ there may be joint breakdown. In these cases a Joint Vibration Analysis and CBCT Cone Beam Scan of the joints is indicated. Very few TMJ will need surgery, but sometimes surgery may be necessary is the TMJ are damaged and do not function properly. What Kind of Doctors Specialize in TMJ? The is no such thing as a “TMJ Dentist” as a matter of credential. Some of the Doctors who may have training in TMJ are: General Dentists, Dental Surgeons, Prosthodontists, Physical Therapists, Osteopaths. We believe the best approach is the Team approach of Dentist and Physical Therapist.